10 April 2017. Press release AccessAgriculture. More than one and a half million farmers that benefit from better market prices through the Fairtrade scheme may soon benefit from broader livelihood support. 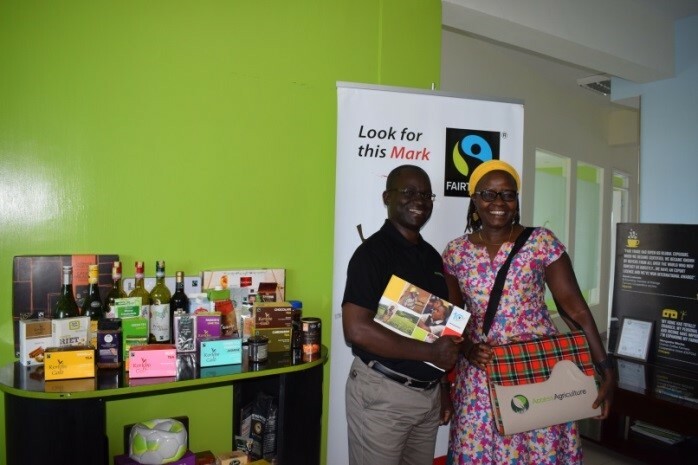 Through a strategic partnership, Access Agriculture and Fairtrade will jointly explore opportunities to strengthen the knowledge and livelihood options of Fairtrade producers and workers. Fairtrade is a global movement that addresses the injustices of conventional trade. The Fairtrade Premium paid to Fairtrade producers is invested in social, environmental and educational projects decided upon by the communities themselves. Most Fairtrade products are still sold on international markets, but a growing middle class in developing countries has opened opportunities for regional and domestic markets. “We have to ensure that farmers’ income not only depends on one or two commodities, such as coffee or tea. Diversifying their sources of income is crucial to the long-term sustainability of farming. I believe that the many videos on the Access Agriculture portal will prove crucial to further empower farmers and encourage new rural enterprises to flourish.” Dr. Nyagoy Nyong’o, Executive Director of Fairtrade Africa, the largest of the three producer networks. While the quality videos hosted on the Access Agriculture platform encourage South-South learning among farmers, further sharing of experiences will be nurtured through the social learning platforms managed by the respective producer networks themselves. Fairtrade Africa, the Latin American and Caribbean Fairtrade Producers (CLAC Fairtrade), and the Fairtrade Network of Asia & Pacific Producers (Fairtrade NAPP) support 1.7 million farmers grouped into more than 1,200 farmer organisations.